 According to the testimony in this oddly comforting volume, women never get over missing dead or absent mothers, whether they were 2 or 22 or even 52 at the time of loss. Edelman's mother died when she was 17, leaving her to cope with a grief-stricken father and younger siblings as well as her own feelings. Although she left for college the following year and later led an adventurous, independent life as a journalist, she discovered one day when she was 24 that she missed her mother so much that she was in physical pain. From that experience came a magazine article and this book. 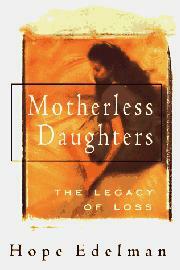 Extensive interviews and correspondence with hundreds of motherless women (self-selected through answers to ads and other outreaches) and dozens of experts taught Edelman that losing a mother through death or desertion at any age has ramifications throughout a woman's life. Even when grief is adequately expressed and the remaining family members are supportive and loving, motherless women find themselves longing for the lost parent at critical junctures in their lives: the first day of school, onset of menstruation, loss of virginity, marriage, childbirth, menopause. Daughters tend to anticipate death at the same age as their mothers' demise, in particular if it was the result of a physical or psychological disorder that might be inheritable, such as cancer or depression. Also discussed are the tricks of memory that turn the lost mother into a paragon or a wicked witch, and the difficulties experienced in adult relationships due to anger and fear of being abandoned again. As the author says, ``[My mother's] presence influenced who I was, and her absence influences who I am.'' Many women will find this book painful, but it's reassuring to have the company of others when dealing with the complex emotions and lifelong effects of a mother's loss.